It’s tough to try to find the ‘best’ empanadas in Buenos Aires (just ask Saltshaker). 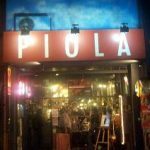 Primarily because there are so many different places to try them at, and of course many different types of empanada from across the different regions of Argentina, and even the rest of Latin America. At Cumana in Recoleta, the empanadas are very good, are of excellent value, and your empanada craving will be properly satiated. Empanadas, vino tinto and… colorful crayons? At Cumana, the empanadas are not the only fun to be had. As shown in the photo at the top of this post, colorful crayons are available for children and grown-up kids alike, to be used on the paper tablecloths. This of course inevitably leads to silliness such as chalking down your order on the table in front of you. 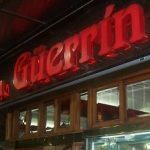 Still, if your Spanish pronunciation is a little rusty, it definitely beats plain old pointing at the items on the menu that you want to order. As well as creating this fun juvenile air with the crayons, the general atmosphere at Cumana is also buzzing, busy and brash. 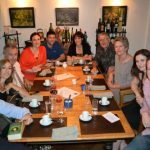 The tables and seats are fairly small and packed in tight, and the place always seems to be full at both lunch and dinner sittings, so it is not a place to go for a quiet, relaxed or intimate conversation. Instead, Cumana is there for traditional Argentine food in a traditional energetic, rustic Argentine setting. OK, so the service is pretty slow, but this is something forgivable in Buenos Aires, because it really is the norm here. You just have to adjust to it, and change your expectations accordingly: i.e. let go and relax, there’s no rush. As you can see, the empanadas at Cumana look pretty tasty. They should be properly browned in places on the outside, and even slightly burned here and there. It just adds to the flavor a little. So Cumana delivers on that front. Lomo Picante – Chopped lomo (tenderloin) steak in a mildly spicy, meaty sauce. This is a great one to start with. It’s not as spicy as the name suggests, but the more subtle flavors of a frankly delicious sauce to come to the fore. And the chopped lomo steak easily beats the standard minced beef from your average empanada de carne. Humita – Creamed corn. Cumana’s version outdoes most local attempts by using a lot of corn, and just the right amount of tasty white cream sauce, and so their Humita gets the thumbs up. Jamon y Queso – Ham and cheese. Apart from beef, jamon y queso is the next most common empanada filling you see in Buenos Aires. It is a basic, rarely spectacular empanada filling, and to be honest, quite hard to mess up. Cumana does a respectable version, with a good amount of ham, which sometimes can be a problem. Choclo, Calabaza y Queso – Corn, squash and cheese. A great combination of fillings that really work wonders together. Not a traditional mix, but one of Cumana’s creations that really make their selection a step above the rest. Cumana also offers up many other great regional dishes from around the rest of Argentina and Latin America. Their Locro, Mondongo and Tamales are all very tasty. In fact, in addition to enjoying the same empanada fillings at Cumana, Saltshaker also speaks very highly of their Locro. 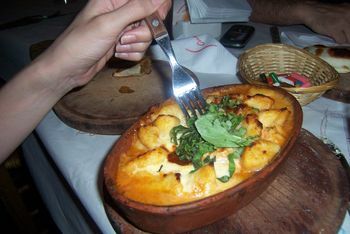 Also very traditional in the city of Buenos Aires are noquis (gnocchi). Pictured above are noquis con crema de tomate y albahaca (gnocchi in a creamy tomato sauce with basil). They are cooked in a clay pot in the same oven as the empanadas, and with lots of cheese in the creamy tomato sauce, which produces a lovely crunchy top, and a delicious gooey creamy, cheesy mess underneath. Simply spectacular. 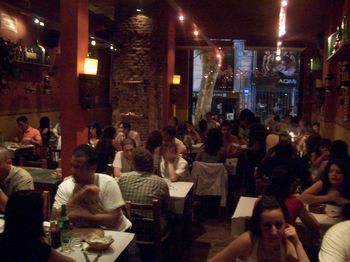 Go with a few friends, order a bunch of different empanadas (especially the delicious lomo picante and choclo, calabaza y queso versions), maybe a few other different traditional Argentine dishes such as the Locro, and share the lot. You will eat extremely well for very few pesos. Wash it all down with the house vino tinto (red wine) and your Cumana experience is complete. El Alamo Bar Shoeless Joe's El Alamo is your typical expat dive bar in Buenos Aires. A good place for lots of beer, American-style food and international sports events on TV. Located in Recoleta, near Avenida Santa Fe. 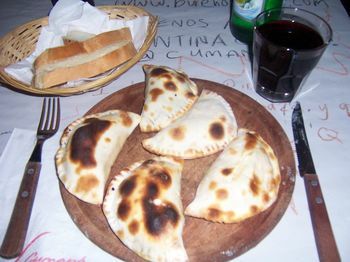 By the way, if anyone has any recommendations for great Empanadas in Buenos Aires, please let us know in these comments! 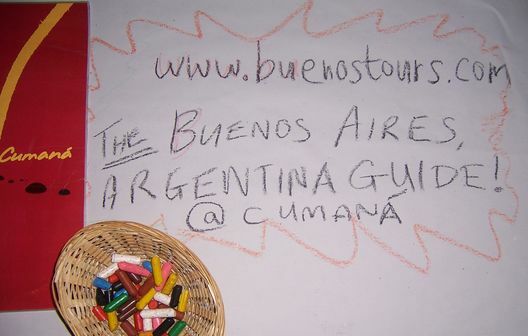 Thanks for the nice comment and welcome to the Buenos Aires blogosphere! You’re completely right and you’re standing up for yourself. Sometimes a man has to draw a line, he will not be shoved anymore, he demands to be listened to, he will NOT be ignored… and apparently the place to do that is not Cumana… but… my point escapes me… uhmm… it was… oh right, I DON’T CARE WHAT THEY THINK EITHER!!!! Cumana is an atmosphere place. For awesome chicken empanadas try Ña Serapia on Las Heras and Bulnes (approximately). Now THAT is a restaurant which has it’s tables close together! Both of them! I noticed that you’ve only mentioned one place to get good empanadas, but have you eaten at La Americana on Bartolomé Mitre in Congreso? In my humble opinion, having tried empanada as far north as La República Dominicana, I would say that they are some of the best.